Welcome to another installment of a segment where we dive into one Elder Scrolls Online’s many Sets, and explore what sort of Builds you can make. Not only will we show you how to get the most from these Sets, but we’ll explain where to get them, what requirements there are to obtain them (if any), and everything else you could possibly want to know about them. In this article we take a look at the Blood Moon Set, which will be used almost exclusively by Werewolves. The Legendary version features 30% Light Attack damage, but it doesn’t get higher than 50%. This Set was added to the game with Update 19 Wolfhunter, which launched in August of 2018. The biggest changes to come with this Update were to Werewolves and the nerfing of Snaring and Defiling effects. With the revamping of Werewolves, they will become viable options for DPS in Dungeons as well as PvP. Blood Moon can be obtained by running the 4-man Dungeon March of Sacrfices, which requires the Wolfhunter DLC as this Set is bind-on-pickup and cannot be acquired from other players. The Style of this Set is Huntsman, which will be obtainable in Update 20, when its Motifs are added to the drop pool of the March of Sacrifices final boss on Veteran difficulty. Since this is a Dungeon Set, you can get Weapons, Shields, Armor and Jewelry, but the Armor will always come in Medium. The Traits on this Armor are random, so you may have to farm several times in order to get the ones that you need, but the Jewelry for this Set comes with the Robust Trait. Keep in mind that you can use Transmutation to change Traits if you wish, but you will need the Summerset expansion if you wish to Transmute Jewelry. Blood Moon increases your Light Attack damage by 30% and attack speed by 50% for 5 seconds, after Critically Striking with Light Attacks 5 times in a row within 8 seconds, which refreshes each time you Critically Strike. This bonus has an 18 second cooldown, much like Mechanical Acuity. There is no way to extend the duration of this buff (Jorvuld’s Guidance has no effect). What Frenzy looks like on a Werewolf. 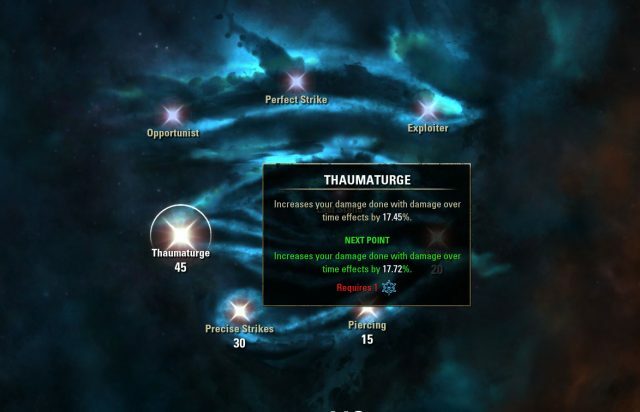 An important thing to note is that Proc Sets can no longer Critically Strike or Critically Heal as of Update 13 (Homestead) so as to reduce their effectiveness in Cyrodiil. In addition, many Proc Sets have cooldowns to keep them from being abused. When choosing a Proc Set to use, if you’re so inclined, you want to not only look at the effect, but how often you can apply it. Finding Sets with little or no cooldown is ideal, because it allows you to trigger them frequently. Blood Moon has a 18 second cooldown, however, it lasts 5 seconds, meaning it’s cooldown is effectively 13 seconds. This is one of the highest cooldowns for any Proc Set in the game. How Blood Moon works is: each time you Critically Strike with a melee Light Attack you gain 1 stack of Blood Scent for 8 seconds. Each time you Critically Strike with a melee Light Attack during those 8 seconds your stack increases by 1 and you have another 8 seconds to Critically Strike with a Light Attack again. When you reach 5 stacks you become “Frenzied” and your Light Attack damage is increased by 30% and Light Attack speed increased by 50% for 5 seconds. If you fail to reach 5 stacks before your Blood Scent runs out then you will start over from zero, but the Set will not go on cooldown. Note that this only increases your melee Light Attack speed, and not your attack speed in general or your ranged Light Attack speed. You can see that Bows do not attack faster despite being Frenzied. Although many Stamina DPS weave Light Attacks into their rotation when doing Dungeons and Trials, this Set is best suited for Werewolves. Stamina DPS will not want to spam Light Attacks for 5 seconds every 18 seconds, and they often use a Bow which does not work with this Set. In addition, Werewolves set bleeding when they Light Attack and they don’t have any other damaging Skills that they could use in a rotation other than Piercing Howl and Infectious Claws. In my opinion, this Set’s purpose was to make Werewolves competitive in PvE content. As mentioned above, if you’re using this Set you should really be playing a Werewolf and this Guide is really tailored to players who are. If you are new to playing a Werewolf or haven’t played one in a long time the first thing I suggest you do is check out my Werewolf Guide, and learn the basics. Things have changed a lot over time, and they are changing more in Update 19, so you’ll probably want a refresher. Secondly, if you’re playing a Werewolf with this Set you will need to choose which Monster Helm Set and another Set to pair it with. 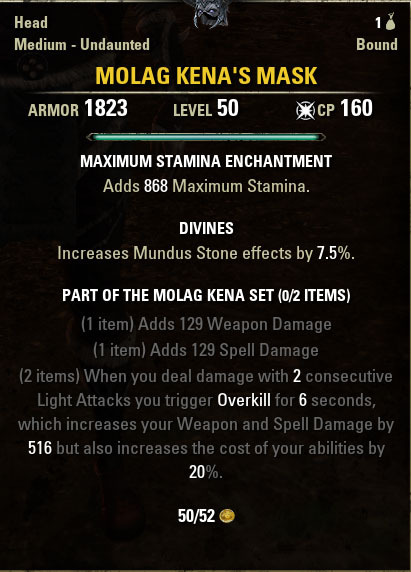 Molag Kena seems too good to be true because it increases your Weapon Damage significantly just for doing two Light Attacks in a row on a target, which synergizes well here. In deciding which other Set to choose I have done some testing so that you can compare how well each has performed. In each case I simply wailed on a training dummy using a rotation of keeping up Infectious Claws, and Major Brutality, mixed with Light Attack after Light Attack only. Molag Kena is such a great combination with Blood Moon. Light Attacks are the name of the game! Please note that Champion Points, Mundus (The Thief) and food all remained the same, and the only thing different about each test is the changing of the second Set. In addition, these numbers are not the highest DPS you can deal, because all of my gear (except Molag Kena) was Purple and Enchants and Traits were not optimized. Also, please keep in mind that there is about a 5% margin for error, as I did not have a perfect rotation each time. Even with a margin for error you can see that Arms of Relequen is the victor here in terms of total DPS over about 2 minutes it takes to defeat the dummy. Of the 9 Sets tested Mechanical Acuity has the highest burst damage potential, as you can proc it and Frenzy at the same time, resulting in crazy damage in a very short span. If I had changed the Mundus to The Shadow I believe this Set would perform much closer to Relequen as well. Otherwise there isn’t a huge difference between the other Sets tested making Hunding’s Rage, Gryphon’s Ferocity and Briarheart alternative choices, because they will also affect the damage of Infectious Claws, which hits multiple targets in Dungeons or Trials. Blood Moon is not an ideal Set for PvP Werewolves because it is much harder to get 5 Crits with Light Attacks in the limited time given, and if you somehow manage to then you have a very short period to deal substantial damage. You may be CCed during that time, or simply not be able to stay on your target as well. There is some good news, however, which is that even though the Set does NOT work against Blocking targets, it does against Damage Shields. Since there are so many players who utilize them, this is some relief. 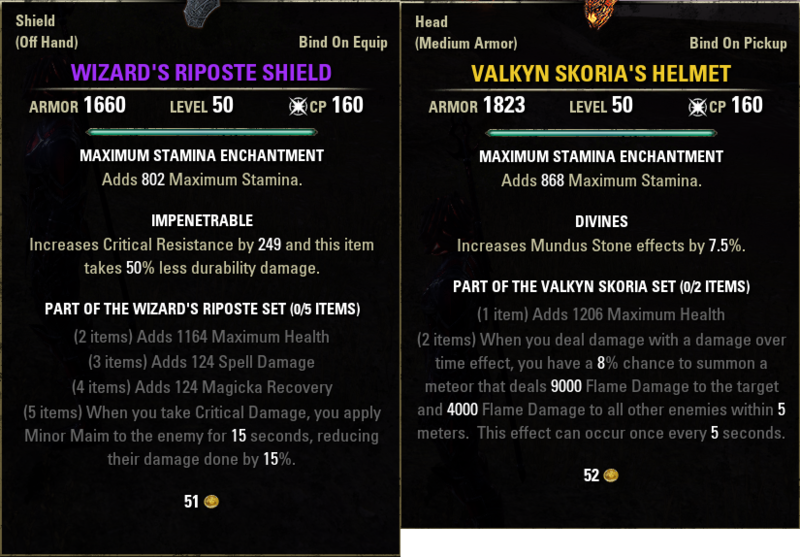 You can see here that you can still get this Set to work against Damage Shields. Viper’s Sting – A solid choice here because it procs reliably and deals Poison Damage, which may help against the other Werewolves after the Update. Salavation – This is a great choice for PvP where you will spend quite a bit of time not in Werewolf form. And, although it won’t increase your damage as much as some other Sets, it will allow you to play as a Werewolf more often. Briarheart – What’s great about this Set is that it not only makes you deal increased damage, but also heals you at the same time. Consider this Set if you need more healing. Essence Thief – This Set not only provides you with additional healing, which all Werewolves can use, but also more Stamina and damage. You will find you need Stamina far more to Block, Dodge Roll, Break Free and Sprint as a Werewolf than to attack, so this is decent choice. Shacklebreaker – An all around great Set for PvP in general, but it gives Werewolves more Magicka which is useful in increasing the amount of heals they pull off. 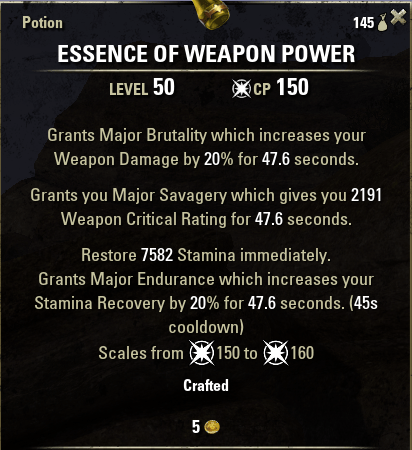 You can craft Potions that give Stamina, Major Brutality and Major Savagery, allowing you to take the morph of Hircine’s Bounty that heals for more instead, and allowing you to still keep these buffs. Werewolves have no way to gain Major Savagery otherwise, unless they use a Set that provides it. This will give you exceptionally high Critical Strike chance, which should be something around 40-70% depending on your Mundus Stone. These pots are great for Werewolves because they have no way to gain Major Savagery and their heal is more effective if they can take the morph of Hircine’s Bounty that doesn’t give Major Brutality. Claws of Life is instrumental in keeping you alive while playing as a Werewolf, more so in PvP than PvE, but it is still much needed either way. Be sure to strike as many targets with it as you can in order to gain massive healing over time. Remember that heals can Critically Strike as well, and since you will have high values, you should gain substantial healing from this morph. Remember to place significant points into Physical Weapon Expert, Man-at-Arms and Mighty in order to increase your Light Attack damage. Precise Strikes will also help because of the high Critical Strike chance and it will also help with healing. Thaumaturge helps with Light Attack bleed and with the damage Claws of Life deals, which in turn means more healing as well, since it’s based on the damage you deal. This Champion Star is really good for increasing Claws of Life and your Light Attack bleed damage, but also giving you more healing because Claws of Life heals based off of damage dealt. 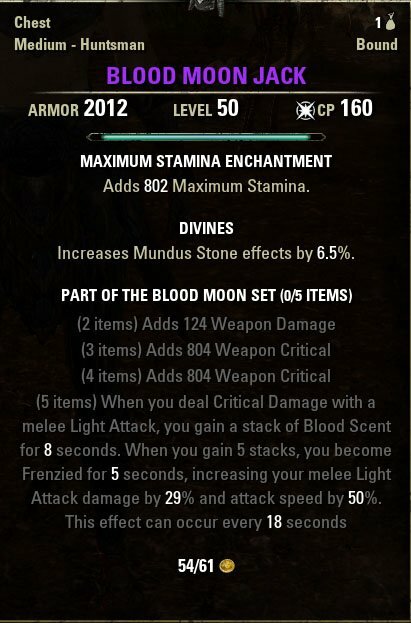 Lastly, as of Update 18 (Summerset) Light Attacks now gain about the same damage from Stamina as they do from from Weapon Damage which is great because Werewolves gain +30% Max Stamina for being transformed. You no longer need to worry about adding raw Weapon Damage and can stack Stamina instead if you wish. To calculate how much your Light Attacks will deal, roughly, simply divide your Stamina by 10, add it together with your Weapon Damage and then multiply the result by 68% and you’ll be in the ballpark.